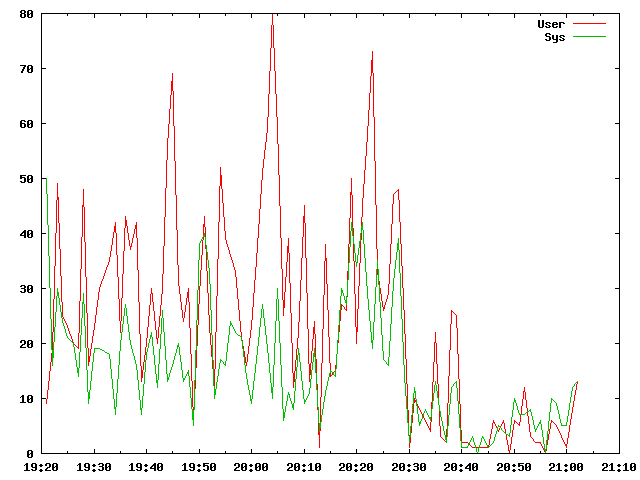 Gnuplot, dstat - easy graphing on Linux · Nifty tidbits! Recently, started fiddling around with how to monitor and graph performance data on linux boxes. Other than the usual tools like top and vmstat, which are either interactive (top) or too textual to do anything much. First off, vmstat, doesnt lend itself well to graphing without additional scripts to lay out the data so tools like gnuplot can be used. Secondly, and more seriously, it doesn’t include a timestamp in the output. Looking around a bit found that dstat seems to be a good replacement to vmstat (and iostat) - and the generated data is consumable with gnuplot. And you’re done. here’s the graph generated on my machine. There’s loads more that you can do - and admittedly, you can do everything by dumping your file to excel. However, that doesn’t lend itself well to a completely automated process. When you’re doing performance testing and such like, you will likely repeat this enough number of times. Not having to do it manually helps big time!